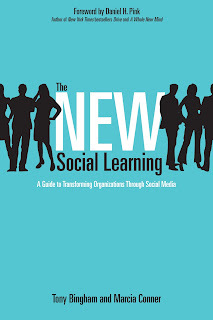 This fall, I read two books on learning and social media: Social Media for Trainers, by Jane Bozarth which I wrote about in this blog on September 25, and The New Social Learning, by Tony Bingham and Marcia Conner, which is the subject of this post. Both books are excellent, but they tackle the subject from two very different angles. In Social Media for Trainers, Jane Bozarth shared practical examples of specific applications of social media tools such as Twitter, Facebook, blogs and wikis in learning situations. It is a very tactical book, and I ended up buying copies for my team members so they could get some ideas on how we can better leverage these tools in our work. The New Social Learning takes a different approach and is targeted to a broader audience. It tackles the topic from a more strategic point-of-view. I have recommended it to a few of our business leaders (outside of the Learning & Development function) who expressed an interest in how social media can be used for learning, innovation, and idea exchanges among our employees, business partners and customers. The authors view the use of social media in organizations as inevitable. Millions of people are using Facebook, Twitter, and other social media tools outside the office as an effective and efficient means of communication and information sharing, why would they not want those same advantages in their work? They express the choice we face as: do we want embrace and leverage social media and integrate it into our work, or - as many companies do - do we want try to ban or restrict social media usage in some way? Obviously, they advocate embracing it and encourage their readers to put social media tools to use in their organizations citing greater shared knowledge, richer learning experiences, and an enhanced corporate culture as some of the payoffs. Mr. Bingham and Ms. Conner take a relatively "tool-neutral" approach in this book. Their position here is that specific tools come and go quickly these days, so rather than discuss them in the book, they provide a companion website: http://thenewsociallearning.com/ where information about specific social media tools can be shared and updated as needed. Rather than discuss specific tools, they discuss usage by categories (such as microblogging and immersive environments) and the value created by each. They do this by providing specific examples and success stories. My favorite parts of the book are the "Respond to Critics" and "Recommendations" sections of each of the main chapters. It is obvious that the authors have heard all the objections and criticisms typically raised by skeptics, and that they have inoculated themselves against them. In this book, they are passing on the vaccine to us.